Bolt, the Super Dog, always saves the day. As he embarks on a cross-country journey to save his dear human, Penny, he discovers that life off the set of his hit TV show is very different… he doesn’t have super powers at all! Will he still be able to save Penny? Does she even need to be saved? Enjoy Bolt and these fun activities with your family and friends or save them for the next birthday party you have to throw. Happy Movie Night! *Serve some copycat movie snacks like “One Stuck Melon” Fruit Salad, Power Usurping Packing Peanuts (use regular peanuts, your favorite peanut butter dessert or even Circus peanut candies), or Squeeky Toy Carrot Cake. *When Bolt and Mittens end up in an RV camp, they beg up quite the meal. Serve your own RV Park dinner by sharing a mix of everyone’s favorite meals. Let each person serve their choice to the others, just like they were really sharing with Bolt and Mittens. Remember to have each person show off their best Cute-Dog-Begging-For-Dinner Face. *Bolt, Mittens and Rhino travel across the country by following a map of waffle house restaurants. Grab the syrup and enjoy some waffles while you watch the show. *When the cats come to tease Bolt one of them shows off his evil laugh. After the perfect demo of an evil chuckle, take turns showing off your best bad guy laugh and see who would fit in with Calico. *Bolt knows that the cats and Calico are good at being bad. They know how to lie and trick people. Play the Two Truths & A Lie game to see if you can be as sneaky. Each person takes a turn saying 3 things about themselves, two that are true and one that isn’t and see if people can tell which you made up. See who ends up the most like Bolt… able to sniff out the most lies! *When Bolt is learning to act like a regular dog, Mittens has him stick his head out the car window and feel the air blowing past him. Take a little drive with the car windows down or pull out a box fan and go for the wind blown look. *Set up a Bolt-worthy obstacle course for your party goers to try out. 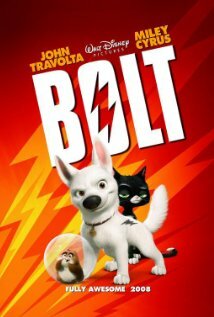 Include a station for each of Bolt’s special talents. “Zoom, zoom” could be a lap around the backyard on a scooter or on all fours, “Fetch” could be throwing something into a bucket, hitting a target, or (if working in teams) throwing something successfully to your partner and “Speak” could be having to blow out a candle by barking or blowing something off a table. Remember you could things that Mittens and Rhino are good at as well. *If you’re looking for something simple for your little ones to do, print off some of these Bolt pages for them to color. *Penny always takes a picture of herself and Bolt after he saves the day. Be sure to take pictures of your Family Movie Night Activities… especially if you have a Polaroid camera. If not, get the look of a Polaroid picture by using a photo editing service like PicMonkey to add a Polaroid border to your picture.